Updated 03-30-19. Vietnamese pho is an easy dish to pick up and enjoy. To the casual diner, consuming pho only requires your ability to place your order, and hold chopsticks and spoon in your hands, and slurp away. For those ready for the next level, pho etiquette is your next goal. There are definitely a number of customs to follow, while a few other protocols are left to individual interpretation and choice. Here's a collection of pho etiquette to help you come closer to pho culture and enjoy the pho experience. As pho is street food to the Vietnamese people, you wouldn't expect too many complex rules. After all, you're in the noisy street, it's hot and humid, you're hungry and all you want is a bowl of pho. 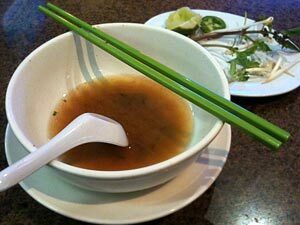 Regardless of whether you're in the streets of Saigon or Main Street U.S.A., this article gives you some guidelines on pho etiquette. 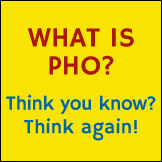 In fact, pho etiquette is really a combination of Vietnamese table etiquette, Vietnamese traditions, and common habits. Vietnamese table etiquette and traditions were born out of the fact that certain individuals hold specific status within both the family and society, and he/she must know his/her place within this disciplined system. Like most other Asian cultures, the single most important thing to understand is give respect to the elders. If you remember this then rules of etiquette and tradition are not as bad as they may sound. On the other hand, common habits are something that will change with the times, depending on where you grew up and how you lead your life. There are numerous individual habits that can be considered acceptable, but I'll just touch on the more common ones here, and invite readers to share their own experiences in the comment section. I'm assuming you're already proficient with a pair of chopsticks and do not want to turn this article into a how-to-use-chopsticks guide. For that you can Google how to use chopsticks. But really, it's like learning how to ride a bicycle, you can Google it or you can just go do it. So here we go. 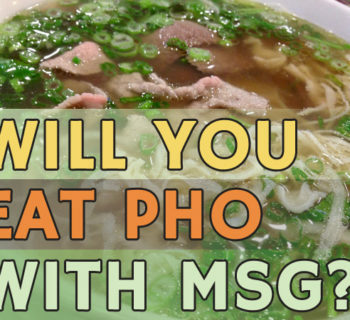 And you thought it's just about eating pho right? Not so fast. Before everyone sits down, look at your table and the arrangement of the chairs. Decide where the head of the table is (or the most important sitting position) and yield to the eldest or most respected person in the group. But it gets more complicated. If there's a very respected male (regardless of age,) then he may be the one to get "the chair." It's pretty easy if you know the tradition, but for those not sure, just do the safe thing: if you know for sure you're not the eldest or most respected one in the group (I hope so,) then don't rush to grab a seat. Hang back and let things fall into place. Someone will ask you to sit somewhere, and that's what you want. Easy. Etiquette for ordering pho is fairly straightforward. For first-time pho diners finding yourselves alone in a pho restaurant, a little help from the order taker is obviously required. Needless to say, if you're in a group then assistance from an experienced friend is obvious. For the experienced pho diners, you probably already know what you're doing. In any case, it's proper to let the more senior member of the group order first. This is consistent with the "respect for the elders" consideration discussed earlier. Everyone else can select their orders in turn, and the youngsters' foods can be ordered by one of the adults. But there's a caveat: you only do this if the person is a very close family member. You definitely do not order for him/her if the older person is just a friend or acquaintance or co-worker or otherwise someone not too close. Ordering pho by the numbers. Just don't if you can help it. Many already know my stand on this. Suffice it to say, if you order by the numbers then you'll be stuck to one restaurant, and once you find yourself first time in a different restaurant, you'll be fumbling with the menu like someone who never had pho before. Not cool. Order your pho in Vietnamese. Modern and experienced diners are a sophisticated bunch. If you can tell good pho from bad pho, then you might as well order it using its own name. If you can take food photos and Yelp, then you can order pho in Vietnamese. If you're going to have rare beef (bò tái) with your pho, go for the sliced raw beef on the side. You'll really show your knowledge on how to enjoy pho, because cooking that raw beef in your hot broth at the table gives you the best tasting pho tai, period. If you're going to have chicken pho (phở gà), inquire about the free-range chicken, and opt for either white or dark meat side dish with dipping fish sauce with ginger. Extra points if they also serve unlaid eggs. "Understanding the Pho Menu: No More Ordering Pho by the Numbers,"
"Tips on Ordering Pho Your Way: Just Tell Them What You Want,"
"How to Order Pho in Vietnamese,"
"Pronouncing Pho and Ordering Pho For the Confused and the Timid." It's a habit for most Viet pho diners to wipe their chopsticks and spoon before eating their pho in restaurants. Some will start doing this as soon as they sit down at the table, even before ordering. This is an old habit of pho being a street food for the working class in Vietnam, and old habits die hard. But don't worry, your typical neighborhood restaurants are used to Vietnamese doing this. They do not mind as it does not necessarily reflect on the restaurant's sanitary condition. In fact it can be a sign of the client "making himself/herself at home," and it is good for the restaurant, especially if it's a repeat customer. Progressive restaurants are very conscious of the image that wiping chopsticks gives to their shops. They'd rather not have wiping going on as they're trying to attract more non-Viet clientele. Some restaurants have begun to insert pairs of chopsticks in paper sleeves, an admirable attempt to show their care for the clients' well being. No matter, people still wipe, even though they know those plastic chopsticks have been through the commercial washer just like at any other Grade A establishment. Alternatively, a few restaurants also make available individually wrapped disposable bamboo chopsticks which successfully prevents wiping. Beside the fact that the bamboo chopsticks in paper sleeves are never used before, who wants splinters right? Now if you're in a full-service, five-star restaurant, then wiping down your chopsticks may reflect badly on you. Be aware of your surrounding, the environment and the other diners. If the restaurant expects you to be a snob, then be a snob and do not make it look like you don't belong. But if you go to one of these places, then you are a snob. To wipe or not to wipe? You now know where and when. Once your pho is at the table, everything you do from here on out is your own business. There normally are 2 things you may want to do before digging in: adding the garnishes (sprouts, culantro, basil, lime and sliced peppers,) and adding the sauces (hoisin sauce for pho and hot chili sauce, mainly the Sriracha brand in the U.S.) that are already at the table. Whatever your preferences, don't let anyone tell you "you must have this or you must add that." These are entirely optional per your own taste. 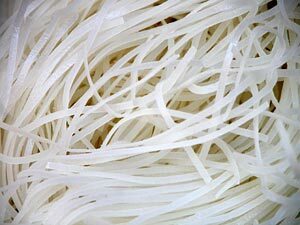 Pho does not require you to have anything added, but adding some of these can enhance your pho. If you are eating authentic pho Bac (northern style pho) then it is meant not to have much else added to the bowl; no sauce, no additional garnishes. Try it to see if you agree with the way it's meant to be enjoyed. 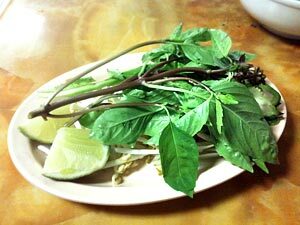 In Saigon and the south, you can find a humongous plate of basil, culantro and sprouts served at your table. You'll also get more lime and Thai peppers than you can handle, so quantity is not a problem regardless of your party size. But in the U.S., and I imagine elsewhere outside of Vietnam, you normally get a plate of garnish just enough for two people. I mean just enough: a couple of stems of basil, some culantro (if you're lucky,) some sprouts, 2 pieces of lime and a few slices of peppers. Understandably many of these items are not cheap outside of Vietnam, and the restaurant has to make money to stay afloat. Garnishes: Let the elders go first, again out of respect. You'll also see younger persons selecting the fresher herbs and offering them to the respected individuals (her mother, father, etc.) On the other hand, it's fair game between brothers and sisters, so that's cool. Garnishes: Unless you know your dining companion well that he/she doesn't eat certain herb, you're expected to split the garnish plate half and half, including the 2 pieces of lime. One for you, one for her. Easy. Raw sliced beef side dish: Some like to cook these immediately by putting them into the hot broth before the garnishes and sauces. Others pace themselves to get the just-cooked or rare texture and taste every time. It's your choice, but make sure the broth is still hot enough when you dip in your last piece or it will be quite rare! My rule of thumb is the broth will no longer be hot (safe) enough about one-third of the way through your bowl. So load them up. Dipping hoisin sauce and hot sauce: Some like to squeeze a mix of these sauces into a small saucer so they can dip their beef in during the meal. This gives you extra kick in flavor, depending on what you prefer, sweet (hoisin) or hot (chili.) This is also great for dipping meatballs if you ordered some. Side dish of free-range chicken (pho ga): the chicken side dish sometime comes with chicken heart, liver, etc. 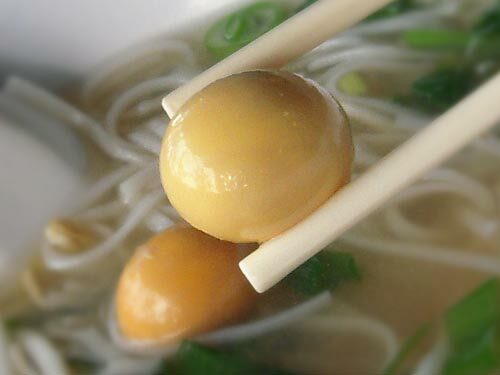 If there are unlaid eggs then they would already be in the bowl with the broth and pho noodle. The fish sauce with ginger is for dipping the meats and is never poured straight into your pho bowl. So regardless of how much you love fish sauce or ginger, don't dump it in! It's for dipping only. Stricter traditional codes also call for the elders and respected ones to be invited to have the first taste of the food, or at least be invited before you dig in yourself, similar to saying "bon appétit." But in less formal situations, you can just wait for them to take a first sip, and then go for it yourself. By the way, because many Viets are Catholics, saying grace can be a common practice. If you have a Catholic friend at the table, be aware of this and give the person time to finish his or her prayer, then everyone can dig in at the same time. It's the right thing to do. The proper way to finish a meal in Vietnam is to put your chopsticks across your bowl, like making a bridge. This may conflict with Japanese convention to never bridge chopsticks over a bowl, but Viet traditions follow many Chinese traditions, and this is one of them. While second and subsequent Viet generations outside of Vietnam begin to lose this tradition, it still is the accepted way to end a meal. If you're still eating your meal and want to rest the chopsticks, then rest them on the table with the eating ends on a chopstick rest (if available) or over a napkin or plate edge to keep clean. You can observe this practice by Viet/Asian people in many restaurants. Simple, respectable, and elegant. Must you use toothpicks after the meal? Then cover your mouth while using it. Pretty much common sense here. Oh one last thing. While it's okay to order pho to go or take out, taking leftovers with you is a no-no. You know, the leftover broth, with maybe little bits and pieces of food still floating around in it? Here's the thing. You will notice that take-out pho always has the broth and noodle separated in their own containers, only to be put together when you're ready to eat. On very rare occasion that you see pho and noodle in one container for take-out. This is not the proper way to pack it unless the customer requests it or intends to eat within a short time. You only have one chance at a bowl of pho, and that is to eat it within 5-10 minutes. Otherwise the noodle turns to mush. Taking leftovers is kind of disgusting, however you look at it. I wince every time seeing this. This was what I wrote about tipping back in 2009. 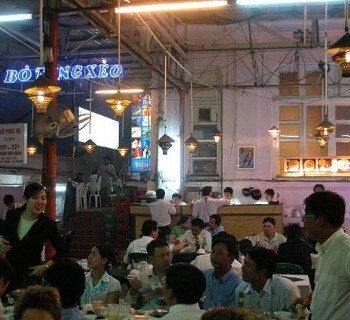 Except for more expensive restaurants where service charges or tipping may be added or expected, servers at most "typical" pho shops in Vietnam do not expect tips as part of their service. Tipping, to the common Vietnamese (the working class,) is not what a Westerner may think. Tips are normally looked at as "spare change" or handouts that a worker would rather not accept. Except for beggars, workers, including those providing a service, do not want to be seen as accepting handouts. Tourism to Vietnam will change this over time, but for many places not impacted greatly by foreign visitors, tipping will probably continue to be nonexistent and not expected. Early Viet refugees carried this exact mindset to the western world. You can still see the same attitude among many Viet even today - this despite living in the U.S. for more than 30 years. With Vietnamese food going mainstream in the U.S., tipping is becoming more commonplace and acceptable by the Viet service providers. So what do you do? For U.S. restaurants, definitely leave tips. But if you're in Vietnam, leave tips if you're in a big city. If you find yourself in a place out in the boondocks, then tipping is not expected. But if you still must do it, then give it to the server directly and separately, with sincerity and friendliness. Or if the owner and server are one and the same (or family members) then just add more to your payment and ask them to not return the change. You don't say "keep the change," but say "no need to return the change." Well time has definitely changed so here is an update. It's amazing that in a short time span of about 4-5 years, how much and how far things have changed. Unless you've been living under a rock, you would notice that Pho and banh mi and Vietnamese coffee and other Vietnamese dishes have gone pretty much mainstream in the U.S. And with this new status came mainstream expectations and etiquette and costs. Everything you can say about mainstream food or food for the mass can now apply to pho, from quality, quick and better service, take-out options, to drive-throughs, open kitchen, seafood pho and fusion pho, Yelp and social media, and of course tipping. Pretty much anything goes nowadays, and customer expectation is very high. This trend will continue to lead pho into more diversified forms as new restaurants (operated by both Viet and non-Viet alike) compete to attract new customers. Paying for your meal has also changed but not as extensive as in the case of tipping above. 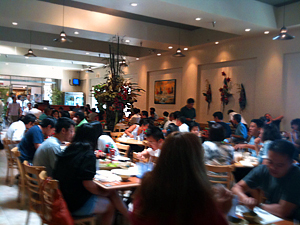 Americans and other non-Viet diners may still notice that many Viet restaurants do not present checks at their tables. This is not bad service. It's just because the restaurateurs do not want to look like they're trying to shove you out the door by asking you to hurry up and pay. This is the common Viet restaurant way and it still exists here in the U.S. There have been major misunderstandings on both sides. The restaurateurs could have learned that western diners expect checks at their tables. Many older restaurant operators never had a chance to be in American social environment and did not understand this. Likewise, Western diners never understood that most Vietnamese restaurants do not ask customers to pay this way for a reason. What we have is a perfect example of clash of culture. Fortunately, Viet restaurateurs and the younger generations are making headway, while non-Viet diners are making progress as well. Key changes are already happening. 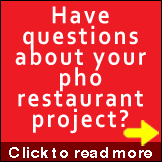 For full service pho restaurants, newer generation pho operators and older but more progressive restaurants are now presenting checks at the table, especially to non-Viet customers. They know customers expect this and they are happy to serve. On the other hand, with the proliferation and popularity of quick-service restaurants, many pho places now have customers paying at the order counter when ordering, then receive food later, negating the need to pay after the meal all together. So what do you do knowing all this? Just do what the "regulars" do. Sometime knowledgeable servers will recognize a non-Viet customer and will automatically present a check after your meal (while not necessarily doing the same for Viet customers.) But if this is not the case, then you (and everybody else) just go to the register and pay there. No more confusion. There you have it. Pho Etiquette. I know, many of us just want a bowl of pho, but I believe knowing these, and maybe practicing at least some of them, will give you better overall experience with your pho than you would have otherwise. Pho etiquette gives you pho nirvana, so to speak. Enjoy. First published Aug 19, 2009 @ 1:26PM. To the Author: What about drinking broth from the bowl? What do you say? yea or nay? @Philip: Great question. I think it is unacceptable to hold up your bowl and drink/slurp, UNLESS you have NO spoon available for use. Even at many pho stalls on the street and hole in the wall places, and regardless of the pho quality, a spoon is almost always provided. As far as I know, this soup-from-bowl-directly-to-mouth practice is ok only in Japanese dining, and allowable for kids who are still learning about how to do things in life. So to recap, a resounding nay. First you say “don’t let anyone tell you ‘you must put this’ or ‘can’t put that’ and the next paragraph you excplicitely state not to put the fish-ginger sauce in the pho. And what’s your problem with leftovers?? I’ll eat it in about an hour or so. And no, it doesn’t turn to mush. It’s delicious. I think the small amount of proper ettiquette information you provided is buried by your stuck up views and personal opinions. @hypocrite: Thanks for reading, but maybe you want to reread if you care about etiquette. The “don’t let anyone” statement is followed by the “These are entirely optional per your own taste” statement. This means don’t let anyone tell you that you MUST have hoisin sauce in your pho, for example, BUT if you choose to for your own taste then do it. Then there are suggested and correct ways to do certain other things. Easy to understand but I’ll consider updating the copy to prevent misreading/misunderstanding. About the leftovers: if you’re going to eat your leftover pho in an hour or in 2 days, that’s entirely up to you. When eating out, Asians do not take leftover noodles/soup with them after the meal, and that’s part of the etiquette and way of life. If yours doesn’t turn to mush and you like eating it, then great. You sound irritated for some reason, but it’s ok. I’m happy your passion about pho is way up there. Leftovers = disgusting. Personally, I think wasting food = disgusting. Yes not everything is good to take to go, but if we cook at home and store anything in the refrigerator that is “leftovers.” So I’m assuming if someone thinks leftovers are disgusting then they have no prepared food in their refrigerator. @Ashley: Thanks for your comments and viewpoints, but I honestly think you are missing the point of the section about leftovers, and the post as a whole. This post is about pho etiquette. Merriam-Webster defines etiquette as “the conduct or procedure required by good breeding or prescribed by authority to be observed in social or official life“. Dictionary.com defines it as “conventional requirements as to social behavior; proprieties of conduct as established in any class or community or for any occasion“. In short, the post describes the normal and accepted behaviors of the culture and people who create pho, how pho is typically enjoyed by its people, and what its standard practices generally are. 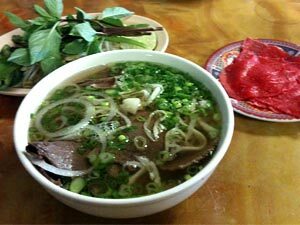 It is about the cultural and social practice of the Viet people and community when it comes to pho. There is also a reason why I put the leftover discussion in the “Finishing Your Pho” section. 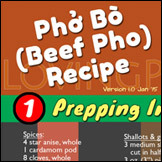 For most Vietnamese, finishing pho means leaving just the broth, as shown in the photo next to the section. In this context, it means the noodle, proteins, and other toppings and vegetables would have been consumed, leaving just a half- or less-than-half-full bowl of murky liquid. For those who have room in their stomach, and if the broth is really good, they would empty the bowl too. But for the most part, the broth has served its purpose, and if you are full already, then it can be discarded. If you are part of the Viet community then most everything written here is pretty much acceptable as normal social practice. On the other hand, if you are not part of the Viet community, then hopefully the post offers a glimpse into what Viet people’s social habits are that you may not be aware of or understand. More importantly, if you are in the latter group, then you can choose to follow the etiquette or not follow it. The whole point is, have awareness and knowledge, and choose your own way. It’s no different than eating out at French, Japanese, Italian or any other “ethnic” cuisine/restaurant each with its own established etiquette. So the post is not about leftovers and what you should do with leftover food in general. Or even how wasteful it is to throw out perfectly good leftover food. This is definitely not what I advocate, in this post or anywhere. I’ve updated the section in hope that further misunderstanding can be avoided.